Girl Meets Dress love finding new products and we just know you are going to love our newest find for your man. Introducing ManCave – an essential natural men’s grooming range free from skin-unfriendly ingredients. Today the male grooming regime has taken on a new style. Wave goodbye to boredom and generic products, it’s time for something inspiring! True creativity also takes pride of place when it comes to choosing, using and enjoying male grooming products with inspired and natural originality, recreating the enthusiasm and panache of a rediscovered process: The Grooming regime by ManCave Inc. The ManCave recipe for success could be summarised as follows: first start with a natural active ingredient, such as the effective amino L-Arginine. Follow up with 12 essential oils, then complete each product with a signature key ingredient, ranging from Caffeine, Panthenol, Shea Butter, Borage Oil to the captivating scent of Cedarwood. At Girl Meets Dress we believe there is no better accessory to your Girl Meets Dress outfit than a dapper looking (and smelling) man! Simply order from Girl Meets Dress this week to receive either a Natural Face Moisturiser or revitalising Lemon & Oak ShowerGel by ManCave. Enriched with bioactives to create a soothing easily absorbed formula, ManCave’s innovative natural face moisturiser rejuvenates, re-textures and helps firm skin leaving a smooth matte finish. Caffeine stimulates the skin to help reduce the appearance of fatigue, whilst organic Borage oil locks moisture into the cells defending against dryness throughout the day or night. 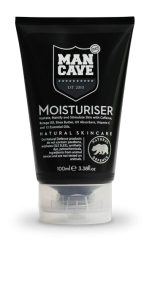 The ManCave hydrating moisturiser is formulated with UV Absorbers and Vitamin E to help protect against free radical damage to the skin. The Lemon & Oak ShowerGel is the second natural Shower Gel of Man Cave’s range that was developed to uplift, invigorate and stimulate. Lemon Oil – known to relieve and lift spirits – helps focus the mind while hints of Rosemary aid the feeling of contentment. Vetiver and Bergamot aromas assist concentration with their combination of energising and relaxing properties. The ShowerGel’s natural cleansing action is boosted by the anti-bacterial action of Lemon Oil and the soothing Aloe Vera. Tags: Partner, Partner Offer. Dresses, Girl Meets Dress, male grooming, man, mancave, moisturiser, offer, Partner, products, showergel lemon, Skincare.